Bedbugs - Hamtramck Pest Control LLC. Contrary to popular belief, there is no association between bed bugs and filth. 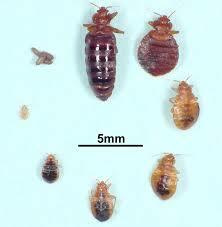 Bed bugs feed on human and animal blood. As long as there's a source of blood available to them, they will happily take up residence in even the most pristine home. Dirt does not cause bed bugs. For bed bugs to infest your home or office they've got to hitch a ride on someone or something. Bed bugs don't usually stay on their human hosts after feeding, but might hide in clothing and inadvertently go along for the ride to a new location. Most often, bed bugs travel in luggage after someone has stayed in an infested hotel room. Bed bugs may even infest theaters and other public spaces, and spread to new locations via purses, backpacks, or coats. ​AK9 inspection is more accurate for finding bed bug activity in public places such as restaurants, offices, movie theaters etc.